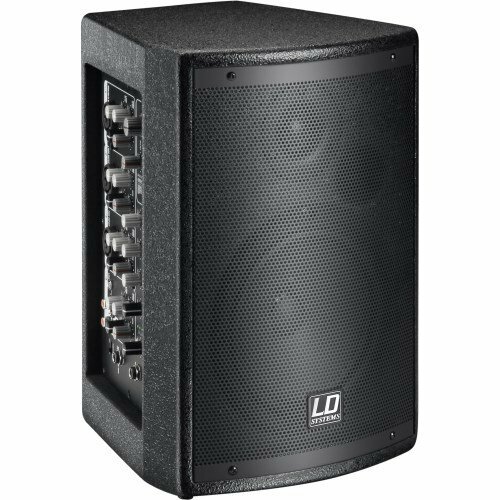 The LD Systems DAVE 8XS is a portable 2.1 multimedia system with a high-performance 8" band pass subwoofer and two satellites (each 4" + 1", with silk dome). The system provides crystal-clear sound and was specifically designed for multimedia applications such as home PA or gaming; it is also suitable as a monitor for DJs or keyboardists or as a music system for smaller venues such as bars and cafés. The high-performance A/B amplifier built into the subwoofer provides for both the subwoofer and the satellites. The multimedia system LD DAVE 8XS has line inputs in XLR and RCA format and is equipped with all standard protections. The built-in limiter keeps the system safe from overload and ensures a long service life. On the side of the subwoofer, in addition to an ON/OFF switch and a phase reverse switch (180 Degree), there is a separate subwoofer volume knob that allows you to find the perfect mix of brilliant treble, punchy mids, and powerful bass. From serial number 130818000001, the satellite speakers are equipped with a 16 mm flange and are therefore compatible with the speaker stands from LDDAVE8SET2. If you have any questions about this product by LD Systems, contact us by completing and submitting the form below. If you are looking for a specif part number, please include it with your message.